Asado is actually a spanish term cut meats which are cooked in open grill. 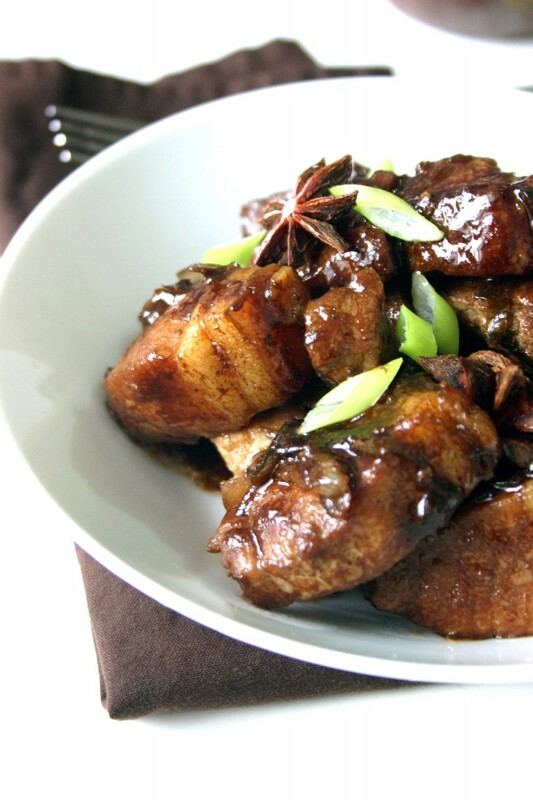 In Philippines on the other hand, asado is an interesting dish with meat a little bit sweet and soury in taste. We can use the left-over in making the fillings of the popular chinese buns “Siopao”. Put the pork in a saucepan and add vinegar, pepper and half of the pounded garlic. Later, add the salt, bay leaf, star anise, brown sugar, honey and soy sauce. Allow it to boil for 2 minutes.Add 2 cups of water and let boil until pork is tender. Fry the potatoes until golden brown, then set aside. Saute garlic, onion, and tomatoes, then add pork mixture, potatoes and atchuete juice, to the mixture and cook until done. Serve hot. HA HA HA HA HHA HAH P[WEDE NA AKO MKA PAG HANDA PARA SA PAGLUTO NG BEST ASADO YUMMY @!!!!!!!!!!!!!!!!!!!!!!!!!!!!!!! I just tried your recipe but didn’t follow the 3 cups of vinegar becaue i’m sure it would be very sour and for sure it was a bit sour just by using 6 tbsp of vinegar. I used paprika instead of asuete because I don’t have any. The picture looks so good but not the same when cooked using your recipe. Also, I don’t understand why the potatoes needs to be fried until golden brown. This ASADO recipe needs a major major revision this aint taste good at all… The real asado has liver spread fyi! it’s great, interesting and easy!! This looks like a recipe for adobo, not asado (except for the tomato part). Interesting, but it doesn’t look the asado I grew up loving. Would love to try, though, and see how this pans out. This is not asado! It tastes adobo than asado! It’s a mistake! palagay ko nga napakaasin nyan kasi madami ang suka sa, ako ni konti lang maglagay ng suka parang sweet and sour lang sya tas may oyster sauce para lumasa ng maayos instead na soy sauce lang ang gamitin..
palagay ko nga napakaasim nyan kasi madami ang suka sa, ako kasi konti lang maglagay ng suka parang sweet and sour lang sya tas may oyster sauce para lumasa ng maayos instead na soy sauce lang ang gamitin..